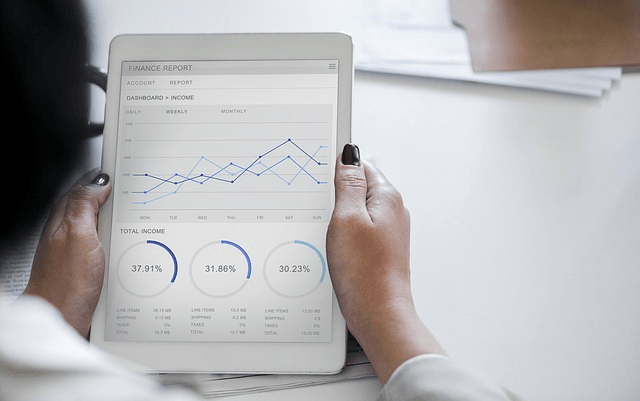 With two types of charting and intake forms, Wellness or Treatment, you have the flexibility to chart how you need to, whether it's for general relaxation or more-involved therapeutic needs. Clients can log in and complete their intake form in advance of their session, saving you time and encouraging client participation. For schools, Wellness charting means you can start teaching charting right away and add complexity as students advance. Anatomical drawings make charting quicker and more intuitive. Labeled muscles reinforce anatomy for students and therapists. Colors and symbols help identify conditions. 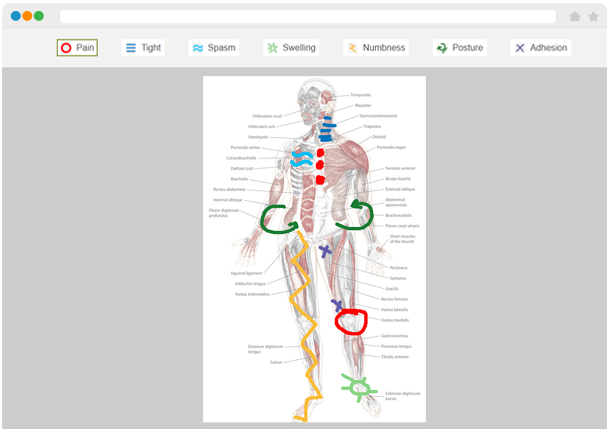 Upload time-saving visual assessments–images and videos documenting range of motion, gait, scars, posture, etc. 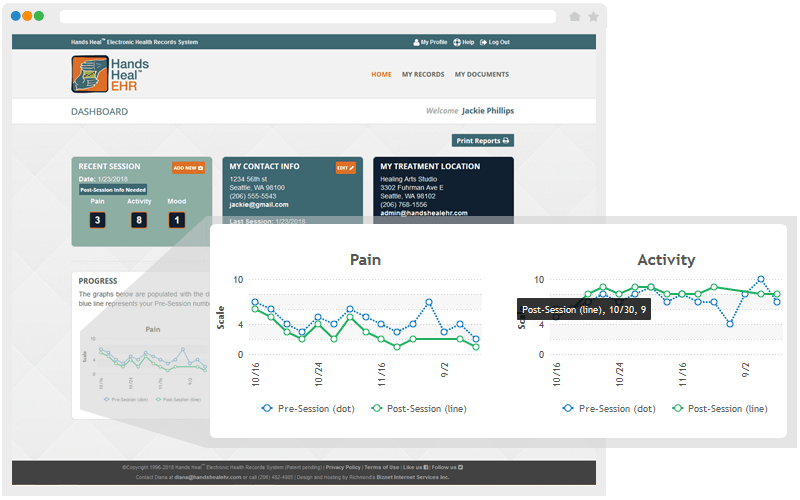 The only system that measures not just pain but mood and activity too, so you get a more well-rounded view of your clients' progress. 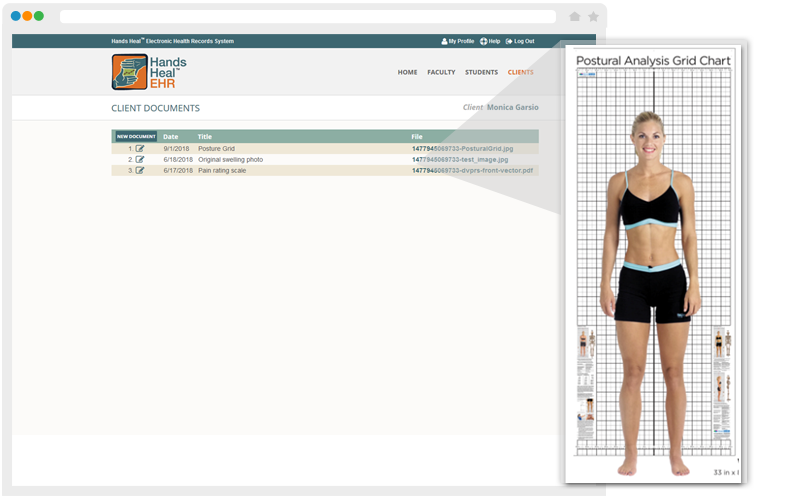 The only EHR that allows clients to sign on and enter their pre and post measurements. This creates more accurate measures, encourages client involvement in their care, and saves you time. An effective teaching tool for schools, giving students more accurate, detailed feedback. 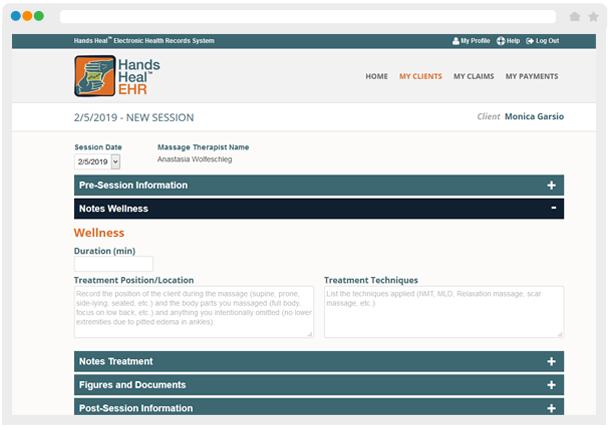 Created by one of the foremost experts on charting, Hands Heal EHR gives you tutorials and instructional prompts that help improve your charting or teaching skills. Because updates to our web-based system are automatic, you can be sure you're following the latest regulations. Schools benefit from curriculum consultation with creator Diana L. Thompson–at no additional cost. Create easy-to-read graphic reports that show your clients' progress. Pre and post measures are displayed side-by-side to highlight improvements. 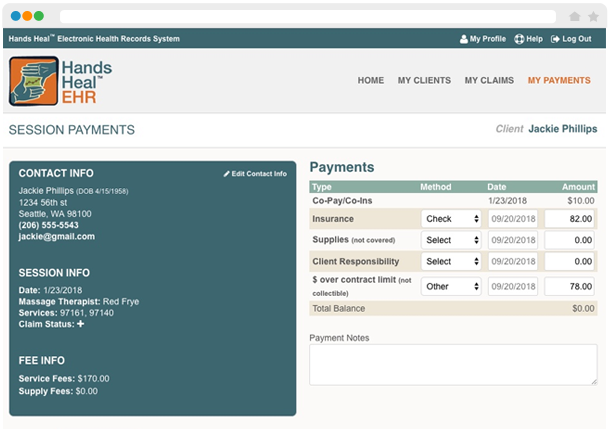 Share reports with other health care providers to encourage referrals and with insurers to streamline reimbursements. Upload files such as prescriptions, insurance cards, and pre-electronic files into client accounts to ensure a more complete health record. Run your business or school more efficiently. Communicate professionally with other health care professionals. Schools can upload documents into student accounts for communication between teacher and students, such as grades and feedback on homework. Switching your client accounts from your old system is easy. You can transfer multiple client accounts in bulk, either from paper or electronic records. With our Advanced Plans, you have the option to generate claims and securely bill insurance. The system automatically populates standard CMS 1500 billing forms using data from your client's profile and session notes. If you find insurance billing confusing, don't worry. Our detailed tutorials and instructional prompts give you all the information you need to bill like a pro. We even include tips to avoid common errors that can delay reimbursements. With our Advanced plans, you can create and print standard CMS 1500 claims. With our Advanced Plus plan, you can submit claims directly to insurance. 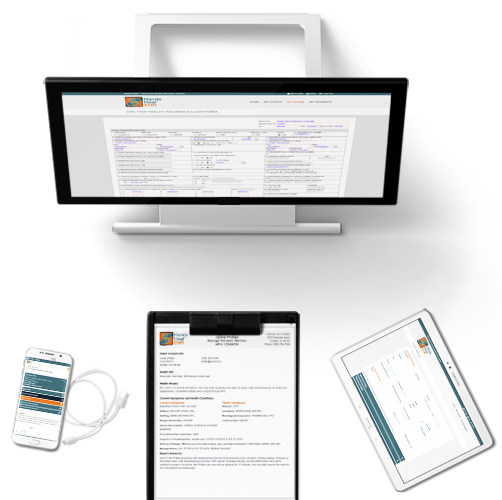 Our trusted partner, Office Ally, checks your claim for accuracy, then securely submits it. With our Advanced plan, you can bill insurance directly if you have an existing Office Ally account. Share printed claims with clients who pay with health savings accounts or out-of-pocket for reimbursement. All responses from insurance are in one location, making payment tracking easier.  You just enter payments received, and balances due are calculated automatically. Email client statements directly from the system. Designed by an educator for educators. Unlimited faculty and students for one low price. Friendly, comprehensive tutorials help teach charting. Curriculum support from creator Diana L. Thompson herself. 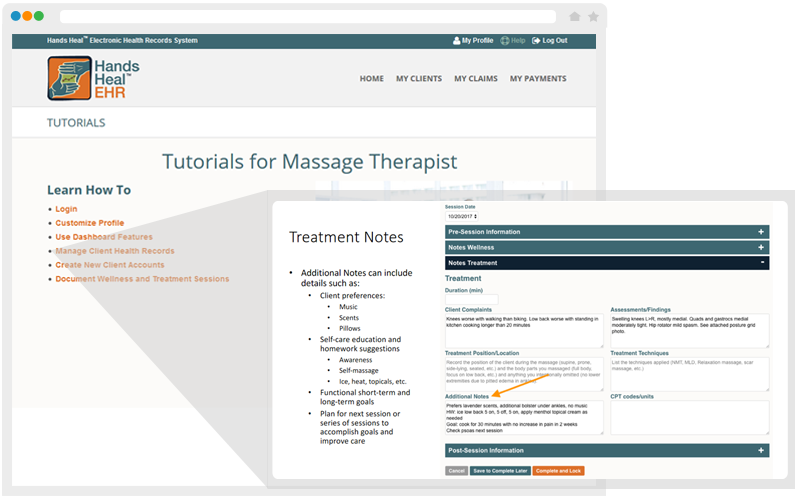 Faculty, administrators, students, and clinic clients each have their own login, with content customized for their needs. 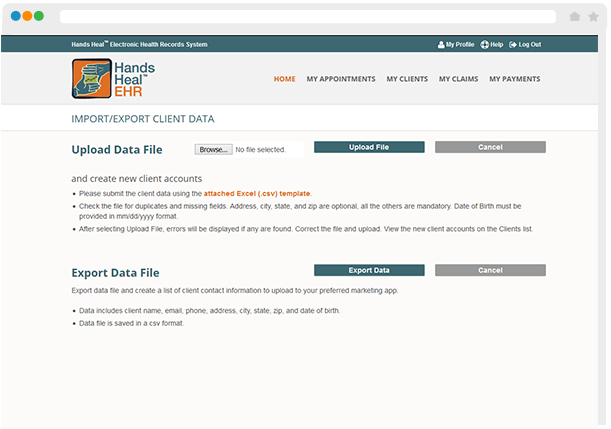 Students can create and be trained on their clients' records. The only EHR that lets faculty see and comment on students' homework and session notes, and upload grades, comments, or announcements into students' folders. Administrators can manage faculty, students, and student clinic. Clients can access their record and give valuable feedback to students. Your clients' data can be de-identified and collated, providing solid data for researchers (with IRB approval). This widely accepted practice is already used by medical providers and physical therapists. Consistent measures, like pain, activity, and mood scales, can be distilled into valuable information. 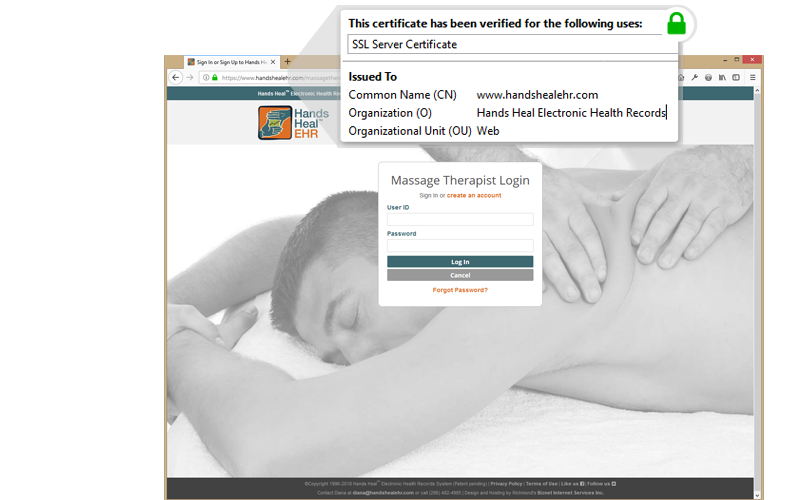 As this information is shared, it helps increase acceptance of massage therapy among doctors, insurers, and the public. Store and access protected health information and meet HIPAA regulations for security and protection. Gain clients' trust with the highest encryption and security. Rest easy and enjoy the ease of being able to access, update, and share important information about client care electronically. Developed using the same technology as financial institutions and the Department of Defense. Built-in training helps you follow and teach best practices for protecting your clients' personal information. Responsive design lets you and your team work from any type of internet-connected device. Start a session note on your tablet, finish it at home from your phone. Have clients fill out pre-measures on tablets in the waiting room. Teach charting from your laptop. Take care of administrative work from your desktop.